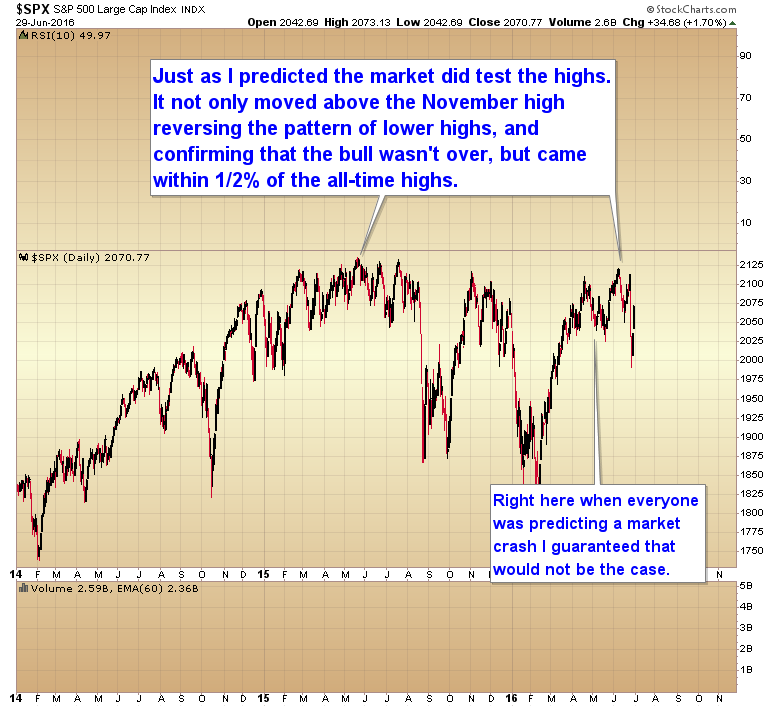 Back in May I guaranteed that the stock market would test the highs by mid June. I made that guarantee as stocks were moving down into a daily cycle low. Everyone was bearish and telling me the stock market had rolled over. I knew they were wrong, because all assets had completed their multi-year cycle lows, and the advance decline line had already moved to new highs. That is not something that happens if stocks are entering a bear market. On top of that the breadth thrust out of the February bottom was one of the most powerful in the last 50 years. During the next two months we added 20% to the stock portfolio, over 20% to the metal portfolio, and I gave traders an option trade that covered their yearly subscription in the first 3 days of the trade. Those people that took me up on my offer have profited tremendously. In fact they have made more money in the last two months than most money managers make in two years. Now I’m going to do it again. I’m going to guarantee that between now and September not only will the S&P test the all-time highs, it’s going to break above the all-time highs and put to rest forever this silly notion that stocks are topping and starting a bear market. Nothing could be further from the truth. Stocks are not topping. They are forming a long consolidation after a huge move up over the last 7 years. Once the consolidation is finished we still have at least one more leg up – the bubble phase. And that phase should last at least another 2-3 years, if not a little longer. This entry was posted in Uncategorized on June 29, 2016 by Gary. Two 90% up volume days in a row. Historically that kind of breadth thrust has generated yearly returns of 20% or better. The perma bears just got kicked in the teeth again. This kind of massive breadth thrust is similar to what we saw out of the February bottom, and typical of a market moving out of a multi-year cycle low. 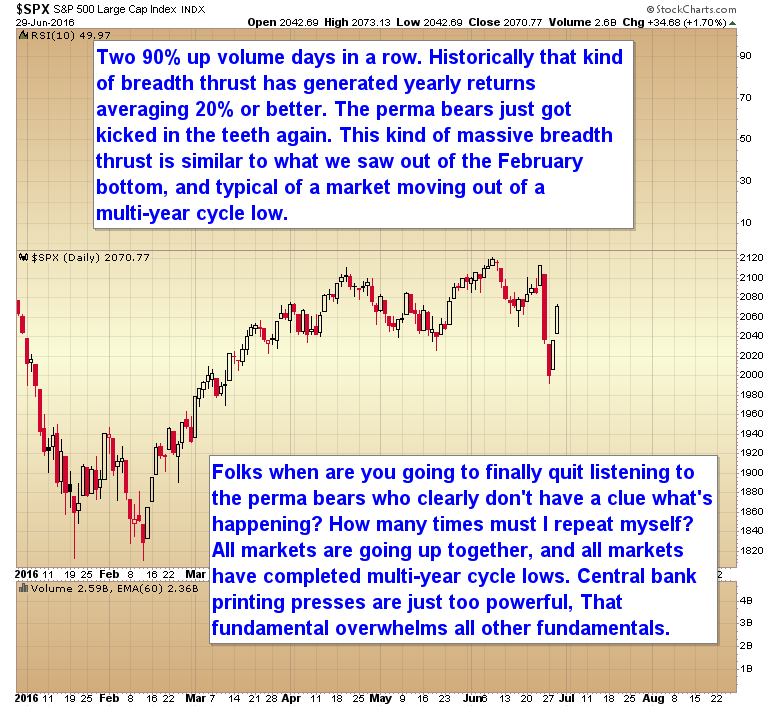 Folks, when are you going to finally quit listening to perma bears who clearly don’t have a clue what’s happening? How many times must I repeat myself? All markets are going up together, and all markets have completed multi-year cycle lows. Central bank printing presses are just too powerful. That fundamental overwhelms all other fundamentals. 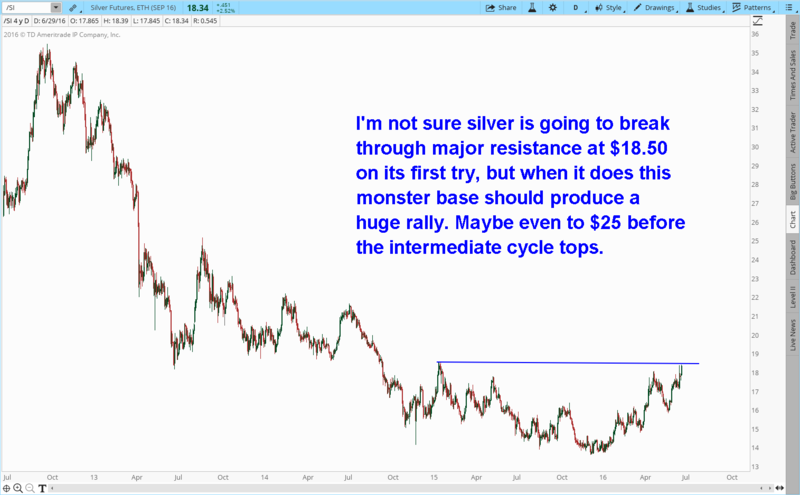 I’m not sure silver is going to break through major resistance at $18.50 on its first try, but when it does this monster base should produce a huge rally. Maybe even to $25 before the intermediate cycle tops. 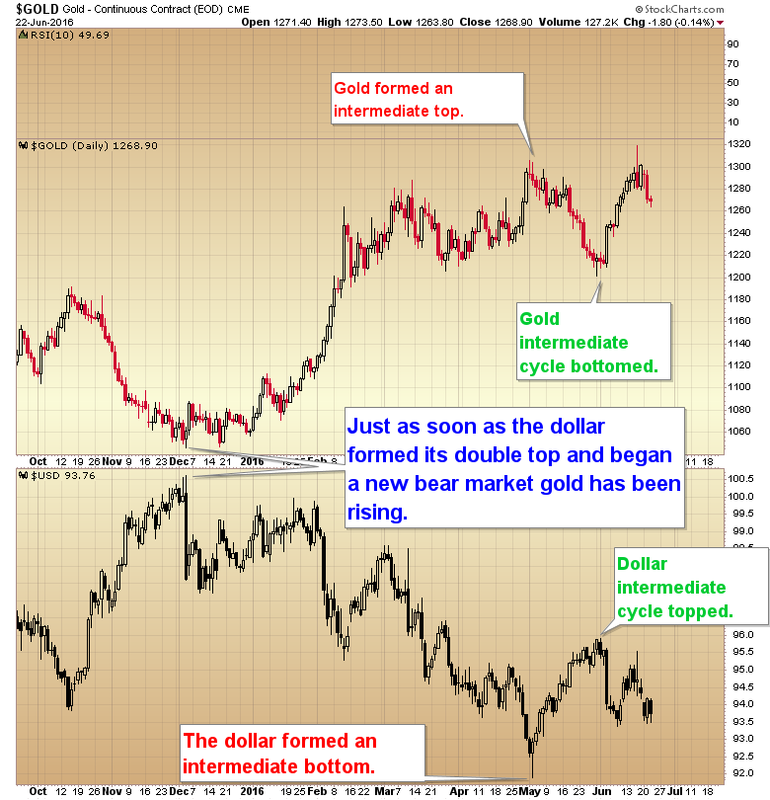 CHART OF THE DAY – WAS THAT IT FOR THE INTERMEDIATE CYCLE DECLINE? 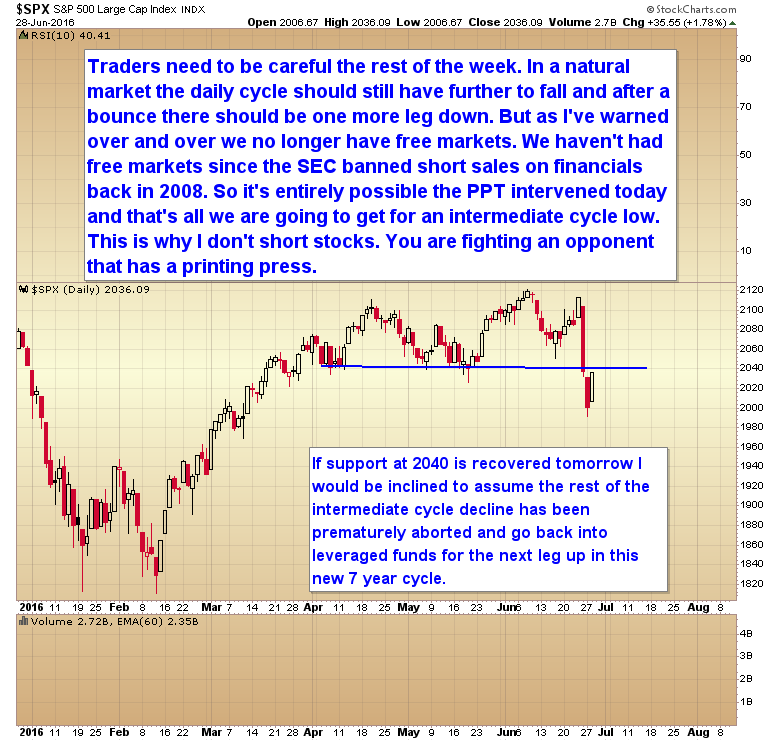 WAS THAT IT FOR THE INTERMEDIATE CYCLE DECLINE IN THE STOCK MARKET? Traders need to be careful for the rest of the week. In a natural market the daily cycle should still have further to fall and after a bounce there should be one more leg down. But as I have warned over and over, we no longer have free markets. We have not had free markets since the SEC banned short sales on financials back in 2008. So it’s entirely possible the PPT intervened today and that’s all we are going to get for an intermediate cycle low. This is why I don’t short stocks. You are fighting an opponent that has a printing press. If support at 2040 is recovered tomorrow I would be inclined to assume the rest of the intermediate cycle decline has been prematurely aborted and go back into leveraged funds for the next leg up in this new 7 year cycle. This entry was posted in Uncategorized on June 28, 2016 by Gary. 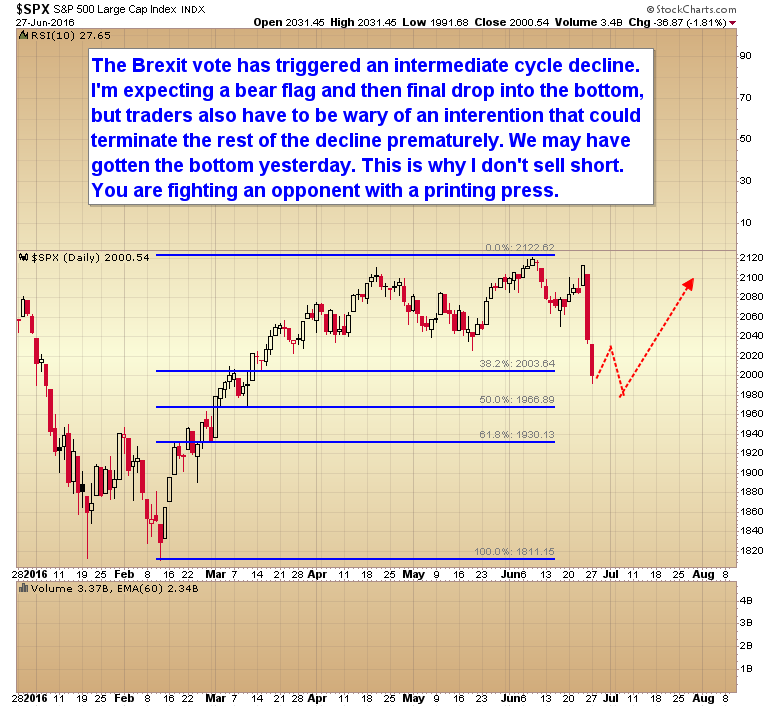 The Brexit vote has triggered an intermediate cycle decline in the stock market. I’m expecting a bear flag and then a final drop into the bottom, but traders also have to be wary of an intervention that could terminate the rest of the decline prematurely. We may have gotten the bottom yesterday. This is why I don’t sell short. You are fighting an opponent with a printing press. It never ceases to amaze me how quickly traders lose sight of the big picture. Any unexpected move in the markets and traders panic. 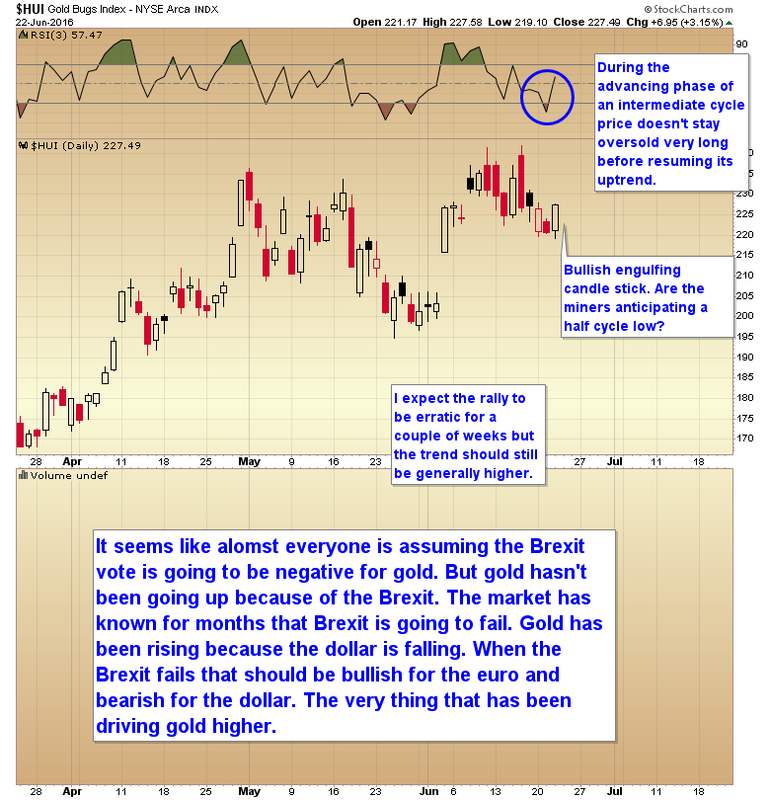 The Brexit vote Thursday was an unexpected event and it took the market by surprise, but it hasn’t changed anything. The bottom line is that every asset class has completed a multi-year cycle low, the dollar has topped and is starting down into its next 3 year cycle low, due in mid to late 2017. This means everything is going up. It’s virtually impossible to lose money in anything from now to mid 2017 if you are long. All wiggles and mistimed trades will be rescued. Folks, it doesn’t get any easier than that. Just buy long and hold on. Eventually the market will turn your trade into a winner. The only way to lose money is because you buy high and then sell low. If you are going to sell low then make sure you buy even lower because price is going higher. The other way to lose money is by selling short. The dominant trend will be against you. If you don’t time short trades perfectly, selling short could cost you your portfolio. 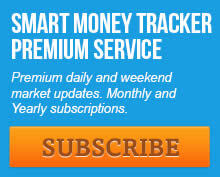 The market will not rescue a mistimed short trade. The only thing worth shorting over the next year will be the dollar. This entry was posted in Uncategorized on June 25, 2016 by Gary. 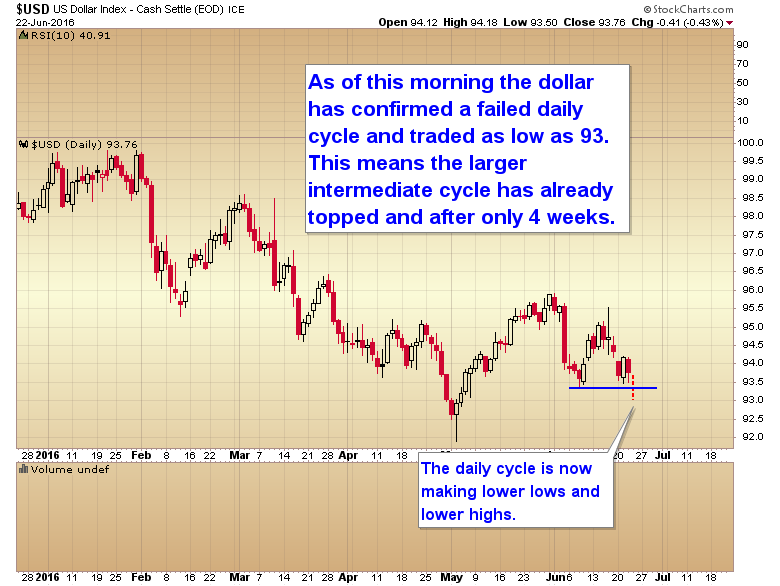 Stocks may move down into an intermediate cycle low over the next 15 trading days. If they do we will again hear the perma bears calling a new bear market. They will be wrong again as they continue to be wrong over and over. 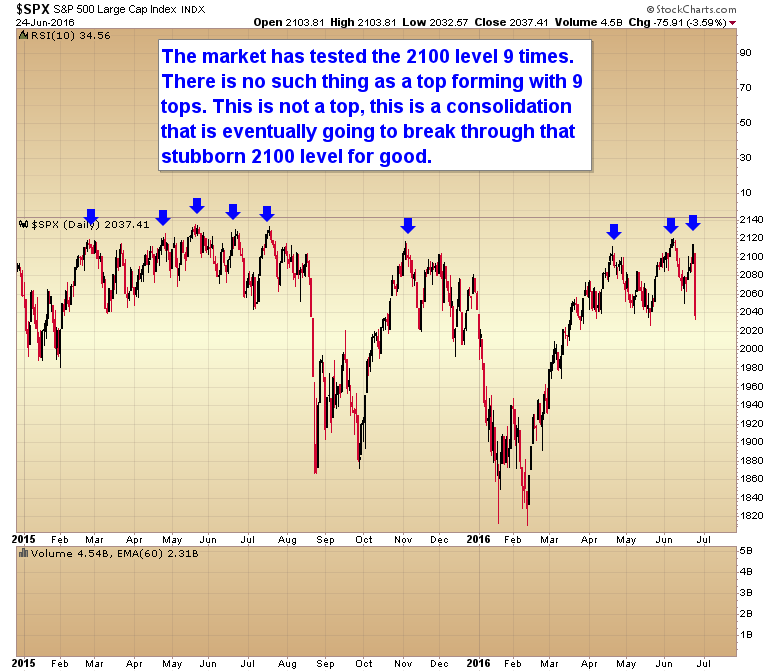 The S&P has tested the 2100 level 9 times. There is no such thing as nonuple top. Heck there’s really no such thing as a triple top. When a resistance zone gets tested this many times it’s a consolidation before a breakout, not a top. This entry was posted in Uncategorized on June 24, 2016 by Gary. 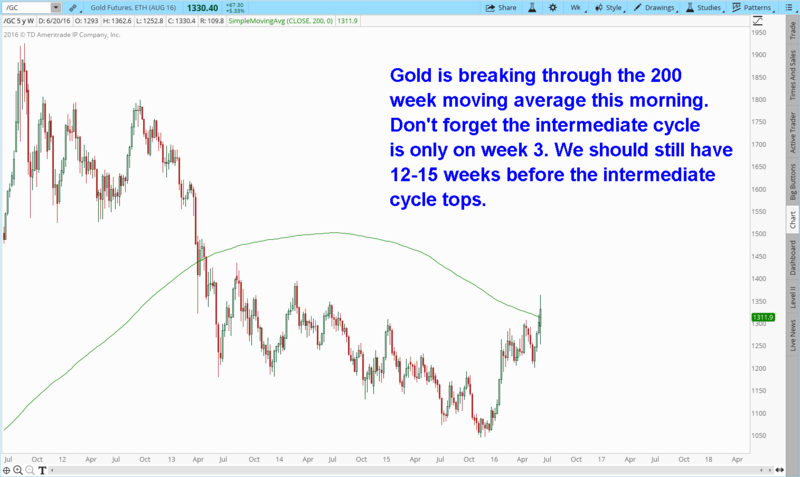 Gold is breaking through the 200 week moving average this morning. Don’t forget the intermediate cycle is only on week 3. We should still have 12-15 weeks before the intermediate cycle tops. This entry was posted in Uncategorized on June 23, 2016 by Gary. 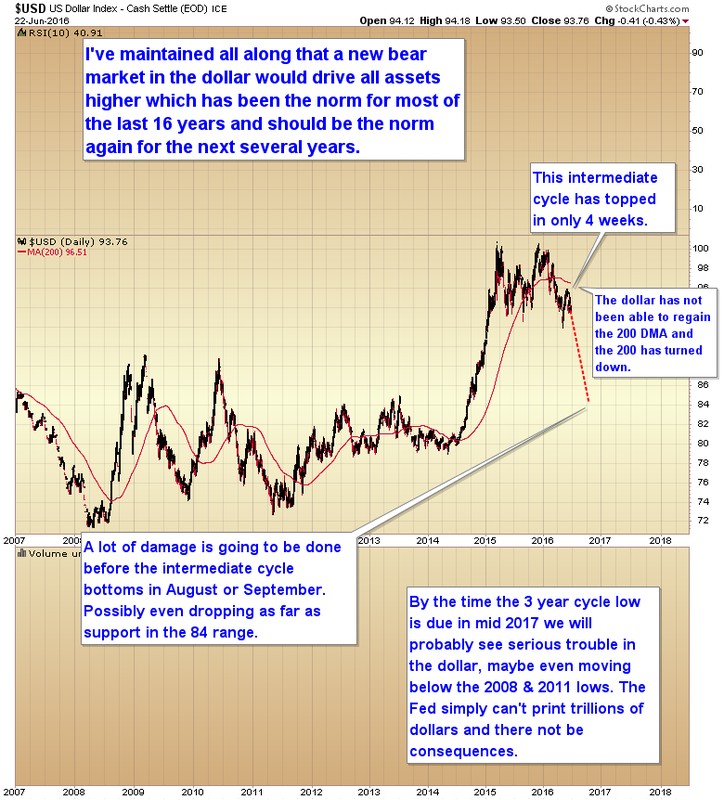 CHART OF THE DAY – ARE MINERS ANTICIPATING A HALF CYCLE LOW? Are Miners Anticipating a Half Cycle Low? This entry was posted in Uncategorized on June 22, 2016 by Gary.